First flying date of the year at OW this weekend was blessed with half decent weather today (Sunday).There was a stifff breeze blowing all day long, but what a turnout! By 10am the car park was almost full, and I don''t think i''ve ever seen so many campers too. In attendance today were near most of the alumni including; Roger and Ruth, John and Mark Digby, John Emmet, Chris and MG Richards, Mike and the 2 Grahams, Ron, Paul, Tony and all the sea of faces who we all know and love. Flying again after the long winter was really fun. More of the same please. As Andy says, it was a good turn out. The weather was kind - the wind sock never went more than 30degrees off the vertical (8-9 mph) and there were calmer periods and quite nice thermals. 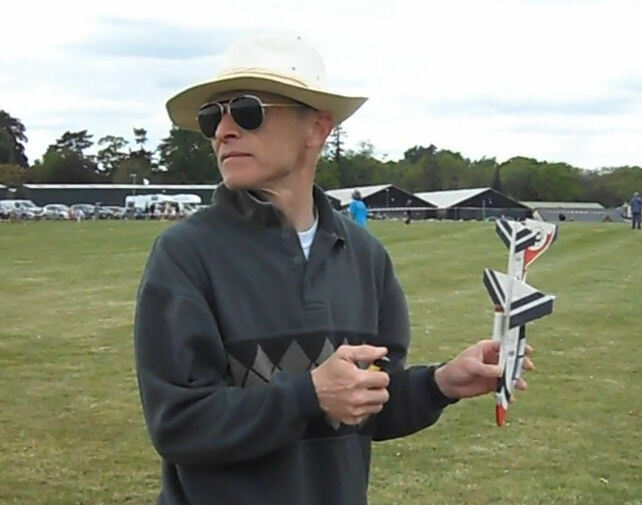 One of which took my Graupner Temco TT-1 out the field against the prevaiing breeze. It was retrieved by Dr John Emmet, who was there with his Jetex 50C powered Viper. Above: John with his genuine Sebel Viper. I'm holding a replica Jetex Wren. 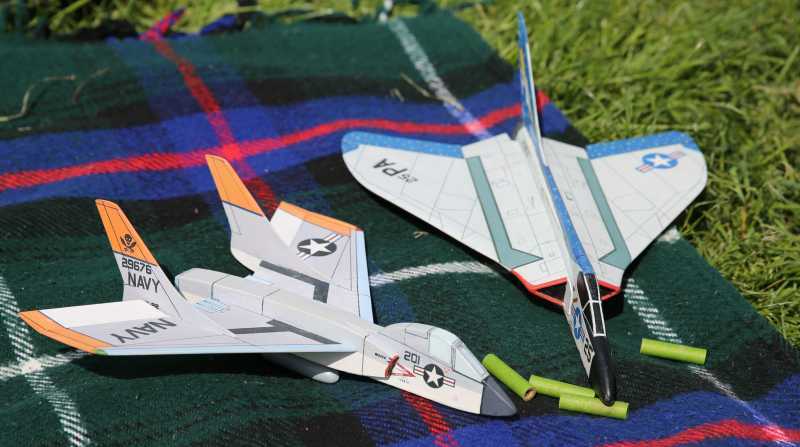 John's Viper made a couple of spectacular semi-balistic flights from an underhand ( ) launch. What Andy doesn't mention, modestly, is that he was showing us how to do it with his L-2 powered T-38 which cut through the turbulent air coming off the trees. Its only 'missed flight' was when he overpowered it with a 2016 '140 mN' L-2. Above: Andy with his T-38, taken at OW last year. It flew (again) splendidly! I was able to test the L-1 and L-2 motors Neil has brought back from Dr Z this year. The L-1's are about 130 mn(!) so work well in an L-2 size model. 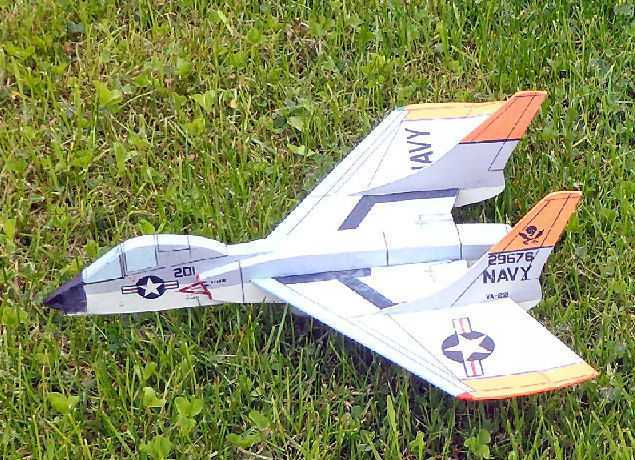 The so called '120 mn' L-2's give exciting flights - my Cutlass loved them, but again, they will over power some models. The 2016 batches of motors are quite powerful, the '140s' working well with my 40 gram Skyray, but will have too much oomph for the average smaller model of 30g. Above the semi-profle Cutass can be trimmed to fly with a range of motors, giving steady flights with an L-2 LT and very lively flight with a 2016 '120 mN' L-2. Andy's comment on seeing the Cutlass cavorting about the sky, "Eject eject!". 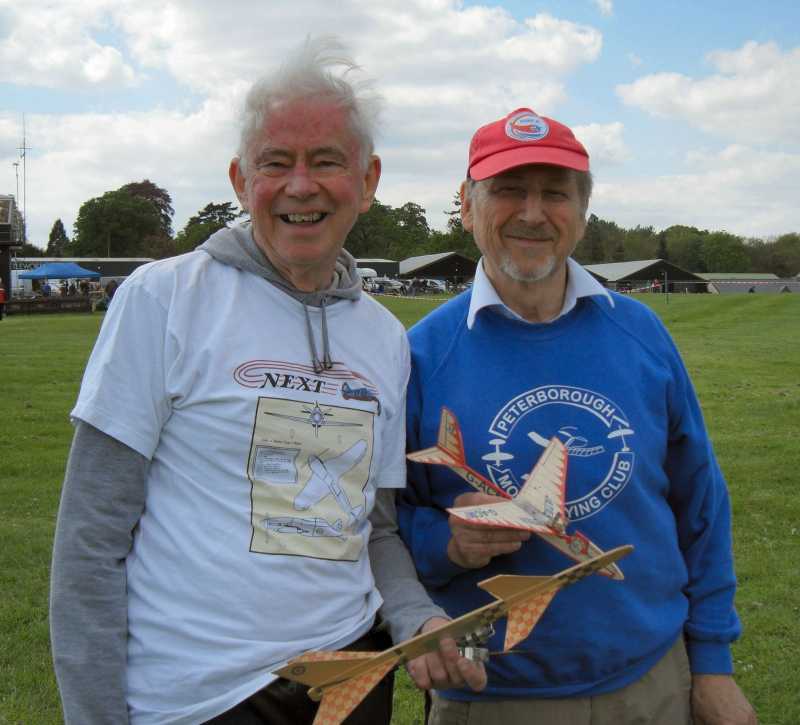 All in all it was a great day with many spectacular flights from Chris Richard's L-3 powered 'Rocket Boy' and MiG 29, two T-38s, John Digby's Sabre, a couple of MiG 15s and my L-1 powered Super Sabre. Above: The little semi-profile Super Sabre flew well and steadily with a 2015 L-1 motor, though it didn't like the bumpy air coming off the hedge at the airfield perimeter. After a bit of re-trimming, it put in a couple of exciting flights with the latest powerful L-1 motors and climbed high as if on afterburner, beyond any ground turbulence, and upset a buzzard! Great to be back at Old Warden for some jet action especially as we had managed to miss all of last years events for one reason or another. The break had at least given me the opportunity to prepare a little better than in previous years and I even managed to have a new model with me. Strictly speaking it was not new at all but built long enough a go for most people to have forgotten it. 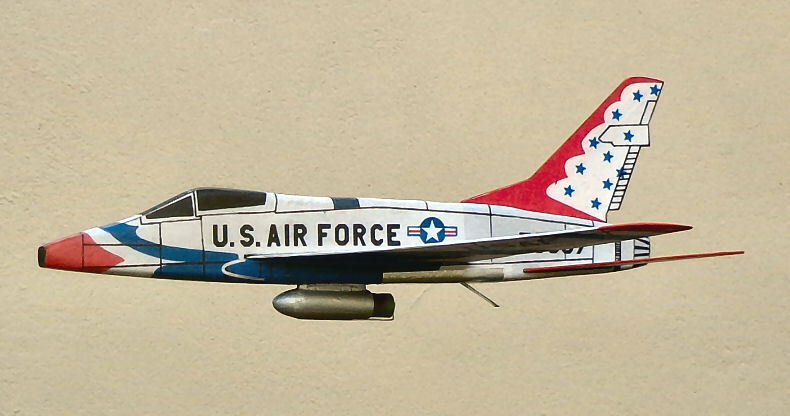 The F86-D Sabre was originally built for L1 power but at the time these motors had become a little week and I did not have the 'grunt' required for this model. I had some weak L2 motors probably 100 mN looking for a home so decided to perform some minor surgery and fit a larger motor tube. Well it turned out to be good decision and although some tweaking is still required I managed 2 good flights before landing well down wind amongst the RC flying preventing a retrieval until the end of the day. I have promised Roger some more details so will probably start a new thread for it. Mark decided to forgo the flying so he could get some video which I have attempted to attach below. I think it gives a good record of what we got up to and do keep watching at the end as unbeknown to me Mark added some post editing footage prior to me uploading to You Tube. All in all a great day and we both left enthused and looking forward to the next event. Thanks for the great video! I felt I was there. Please keep them up as the summer goes on! I hope you will be there in July and join the fun! I didn't know Mark was taking these videos, so zeroed in was I testing Dr Z's latest batches of Rapiers. Nor did I know Brian Gostlow, a head honcho at Impington MAC (he's the editor of their very nice magazine), took this photo of my Cutlass and Skyray. Hopefully, Dr Z will be with us in July. Like the estimable Andy Blackwell, I am looking forward to Old Warden at the end of the month. As we now have a Jetex.org video channel, I'm hoping there will be plenty of 'jet action' to post after the event which will be blessed with good flying weather!